Swedish police secure the area where two people were shot in Malmo, Sweden, on October 21. (CNN) -- Swedish police have arrested a 38-year-old man suspected in a series of shootings targeting immigrants, they said Sunday. "The man was arrested late Saturday night on suspicion of murder and attempted murder," lead prosecutor Solveig Wollstad said. Eight people have been injured and a woman, 20, killed in the shootings which police believe are connected to the gunman, according to CNN's Swedish affiliate TV4. The fatal shooting took place in October 2009, and the seven attempted murders have been between October last year and October this year, according to police. "What connects all these crimes is that the victims have an immigrant background," said Borje Sjoholm, a spokesman for the regional criminal division. Investigators have been interested in the suspect "for some time," Sjoholm said. "What led to his arrest was good old traditional police work and information from the public," he added. "There was new information that came to light, which is what made me take the decision to arrest the man," prosecutor Wollstad said. He denies the allegations, the police spokesman said. 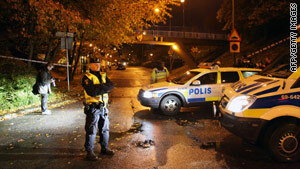 Police said the arrest was made in Malmo, the southern city where the shootings occurred. The suspect is of a Swedish background and was arrested at his home, police said. "Police contacted him last night where he lives. He came out and he was then arrested. All went very calmly," Sjoholm said. Police would not speculate on the man's motives or give any more details about who he is. "He is now suspected of some very spectacular crimes, and we don't want to give any more details that could potentially identify him," Sjoholm said. The suspect does not have a police record in the last five years, according to police. He also has a license for two weapons which were found in his home when police searched his property, they said. "We will now conduct a technical investigation of the weapons, firing them and examining them, all to establish if these are the ones used in the shootings," Sjoholm said. "We are really prioritizing this investigation now. Just because we have arrested a suspect doesn't mean we can pack up and go home," he said. The suspect has been questioned once so far, and more interrogations are planned, he said. The lead prosecutor has until noon (6 a.m. ET) on Tuesday to decide if the suspect is to be formally charged with the crimes. Malmo police have had an increased number of officers patrolling the streets during the last few weeks. "We will continue with our increased presence," said local police chief Ulf Sempert. "We want our local citizens to continue to feel safe and we also want to continue our good relations with the public," Sempert said. "If there are still people out there who have information about these shootings we want them to feel comfortable contacting police and giving us any more clues into what has happened," he added.